I haven’t posted anything in a while. Summer has been busy, with the nice weather I’ve been focused on trying to get outside stuff taken care of. Anyhow, here’s a bit of flash fiction. Needs work, but I’m not likely to do much more with it. The moment she said it, she felt stupid. The place was, after all, empty. Except for a smelly, hairy hipster-type clacking away haughtily at his laptop in a corner drinking his stupid soy latte, there wasn’t anyone else in the shop. The man looked up from counting exact change and squinted at her. He glanced over his shoulder, “You must be new. The name’s Albert,” he said in a raspy voice. Allison could feel her face go red. 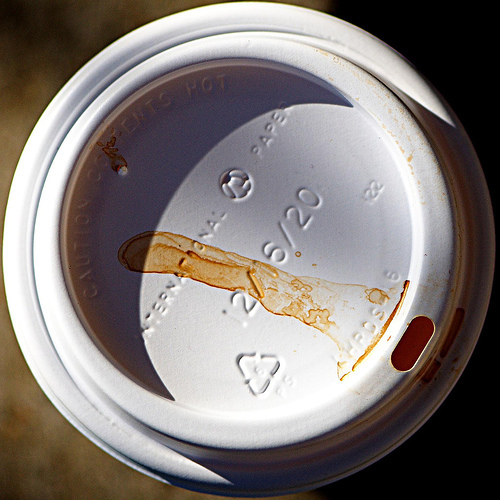 She slide the cups over the counter to the barista who took them without looking up. Albert dropped a couple of quarters into the tip jar and picked his folded newspaper from the counter, tucking it under his arm. It was her second day at the Lucky 13 coffee shop. So far it hadn’t gone well. Aside from the place having the feel of a funeral parlor, the young woman making the coffee hadn’t so much as introduced herself, the tips had been awful, the A/C was always too high and nobody had been particularly friendly. and she couldn’t imagine why two of them should be there on such a quiet afternoon. “Here you are Albert,” The barista said, handing the two cups over to the man. “Thank you miss,” Albert said. Allison watched him slowly make his way to a small table against a tall plate window overlooking the street. “He’s a regular?” Allison asked, struggling to remember the name of her coworker. “Been coming in every Tuesday afternoon since long before my time,” The barista said, picking up a rag. While she was talking, Albert set one cup on either side of the table for two. He took his seat at one of them, and proceeded to unfold it. For most of an hour, Albert sat at his table, sipping his coffee and reading. Every so often he would look over the top of his paper, squint, say a few words, or smile, and return to his reading. Something about it made Allison feel cold. The barista hadn’t returned from her smoke break, but as there weren’t any customers, it hardly mattered. Finally, Albert took a last sip from his cup, folded up his newspaper, and stood up. He looked at Allison, and tipped his hat again before leaving. Allison sighed as she looked at the two cups he’d left on the table. He’d forgotten his other cup. It hadn’t been touched the entire time he had been there. She ran around the counter to retrieve the cup in the hopes she might be able to catch him before he disappeared. The moment her hand touched the cup, she froze and every hair on her body stood on end. It was empty. On the edge of the lid, right where the drinking hole was, she saw the faint smudge of red lipstick. She thought about how Albert glanced over his newspaper, talking with someone who wasn’t there. With a deep breath, she set the empty paper cup back down. Trying to convince herself there was a perfectly logical explanation, she looked up at the large plate glass windows. Her faint reflection stared back at her. Her heart thumped hard in her chest and she clinched her fists. Unlike the room she was in, her reflection was in standing in a crowded shop. All manner of people could be seen reflected in that window. Doing her best to suppress a scream, Allison slowly turned around face the empty room. The sudden rasp of a chair being pulled out echoed off the red-brick walls. It was too much. She let out a clipped scream. With slow, shaking footsteps, she edged her way toward the door. Even if there had been a logical explanation for what she’d seen, she had no interest in hearing it. This entry was posted in flash fiction and tagged fiction writing, flash fiction, ghost story, writing. Ray Bradbury is one of my favorite authors—in fact, Fahrenheit 451 is arguably my favorite book—and this story reminds me very much of Bradbury’s short stories. Bravo, sir, bravo!